Many buildings and structures have brick arch lintels incorporated into them. Brick arches come in many shapes and sizes, the most common of which are curved window arches and flat arch lintels. They transfer vertical loads to abutmenting masonry at either side of an opening. Arches work with keystones that wedge the brick courses into place. 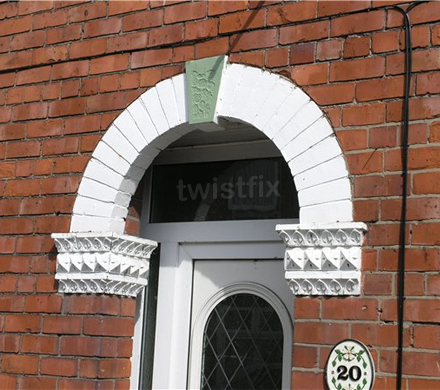 When masonry arches fail a brick arch repair system is required. Why do brick arches crack and fail? When arches or their supports fail then structural movement and cracks will often form above and even through the masonry arch. This sort of cracking can be seen commonly in or around the soldier courses that form the window lintel. Structural movement in buildings is a serious matter and should never be ignored because the problem will not repair itself and the effects will worsen over time until a catistrophic failure occurs. Lintel failure may be result of a number of factors which act in isolation or alternatively they could be working together to have a combined effect. Masonry arches which have been constructed in stone, brick or masonry act as a lintel supporting the weight of the structure above whilst, in many cases acting as a decorative feature. When structural movement is present the masonry arch is unable to cope with this and this is when movemnet will occur and cracking above the windows will be seen. A major reason as to why many brick arch lintels crack and fail is because of their age. Masonry arches were extremely popular in the past. Over the years deterioration of the materials because of frost damage, chemical attack, vibration, and exposure to rainwater penetration can lead to weakening of the structure and ultimately to collapse. Masonry crack repair schemes should always be carried out as soon as possible where cracking is apparent so that the problem is never allowed to worsen and result in the eventual collapse of a structure, leaving devastating results. How can you fix a failed masonry arch? Twistfix has a brick arch repair kit which has everything you need in order to repair your failed masonry arch and what is great is this product is currently on special offer saving you the customer even more money! 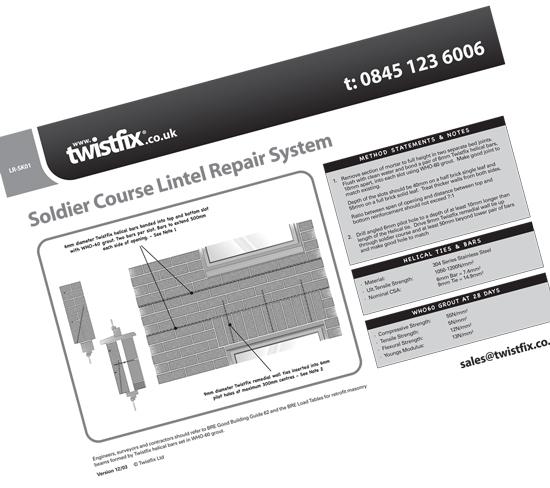 Twistfix Arch Repair Kit has everything needed the reinforcement of soldier courses, brick arches and stone lintels. High tensile stainless steel reinforcement bars are bedded into walls to form deep masonry beams, which carry and redistribute loads. Retrofit brick ties securely pin brick headers into the reinforced zone. 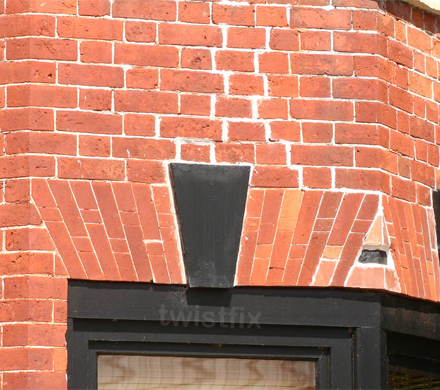 For more informationon brick arch repair systems please contact us on 0845 123 6006 or email sales@twistfix.co.uk.